A new medical service launched this week called Doctor on Demand connects consumers with a US-licensed physician, via a computer, smartphone or tablet. Service calls are $40 for each 15 minutes of consultation. Doctor on Demand says the service is useful for non-emergency, common cases like mild infections, allergies, fever, rolled ankles, bladder infections, nausea, skin infection, nasal congestion, and lab interpretation. The service is not suggested for life-threatening medical problems, like difficulty in breathing, chest pain, convulsions or seizures, or serious head, neck and back injuries. 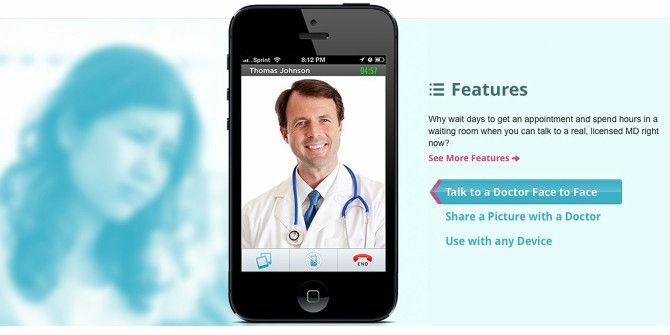 Using a computer, the service’s iOS or Android app, or Kindle device, customers get a face-to-face video consultation, including pediatric questions, with a real doctor who can provide a diagnosis and prescribe medication, or recommend a specialist for specific conditions. After your consultation call reaches the 13 minute mark, Doctor on Demand will ask if you want to extend your call for an additional 15 minutes. If you decide to extend, you will automatically be billed $40 for each 15 minute interval thereafter. At the end of your first Doctor on Demand consultation you can add the doctor you consulted with to your favorite list and be connected directly with that doctor the next you use the service. Consultations require credit or debit card payment, and as for now, Doctor on Demand does not accept medical insurance, though it says it’s working on that option for the near future. Doctor on Demand was founded by Adam Jackson, a software engineer, and Jay McGraw, an author and television producer. Dr. Pat Basu is the chief medical officer for Doctor on Demand. The IOS/Android app "Urgent Care" does the exact same thing, with the same licensed physicians but at $3.99 a call (and no "time limits") - much better deal. It's $160 per hour! It's robbery! If you're on a call with a doctor for an hour, you need to add another 15 minutes to have him/her check your head too. Even a face to face visit in the office rarely goes over 15 minutes. Wait a minute...that's $160 per hour! That's robbery! Forget healthcare, it's now Mafia Medicine. Sounds interesting. How do they handle prescriptions? They call it in to whatever pharmacy you choose. I just used it for strep throat and in less than 10 minutes, was all taken care of. This sounds like a great service. Good to know!